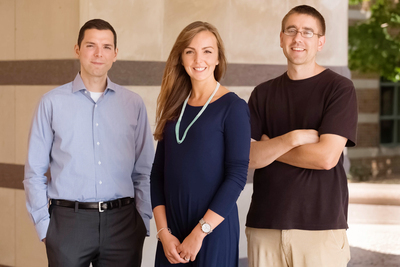 Psychology professor Aron Barbey, left, graduate student Marta Zamroziewicz, postdoctoral researcher Chris Zwilling and their colleagues conducted a new study linking blood levels of a key nutrient to brain structure and intelligence in older adults. CHAMPAIGN, Ill. — A study of older adults links consumption of a pigment found in leafy greens to the preservation of “crystallized intelligence,” the ability to use the skills and knowledge one has acquired over a lifetime. Lutein (LOO-teen) is one of several plant pigments that humans acquire through the diet, primarily by eating leafy green vegetables, cruciferous vegetables such as broccoli, or egg yolks, said University of Illinois graduate student Marta Zamroziewicz, who led the study with Illinois psychology professor Aron Barbey. Lutein accumulates in the brain, embedding in cell membranes, where it likely plays “a neuroprotective role,” she said. Barbey is an affiliate of the Carl R. Woese Institute for Genomic Biology and the Beckman Institute for Advanced Science and Technology at the U. of I. The research team also included Beckman Institute postdoctoral researchers Erick Paul and Chris Zwilling; psychology professor Neal Cohen, also at Beckman; Elizabeth Johnson, of Tufts University; and Matthew Kuchan, of Abbott Nutrition. Abbott Nutrition supported this work through the Center for Nutrition, Learning and Memory at the U. of I. in Urbana-Champaign. To reach Aron Barbey, email barbey@illinois.edu. To reach Marta Zamroziewicz, email mzamro2@illinois.edu. The paper “Parahippocampal Cortex Mediates the Relationship Between Lutein and Crystallized Intelligence in Healthy, Older Adults” is available online and from the U. of I. News Bureau.